LEWIS STEVENSON insists Hibs have not been given a “level playing field” in the race for second place in the Championship after Rangers’ visit to champions Hearts was rescheduled for Sunday, May 3. The Ibrox men’s final league match of the season was originally pencilled in for Saturday of that weekend and was due to kick off at 3pm along with the Easter Road side’s clash at Falkirk. However, the match at Tynecastle has been put back 24 hours and will be shown live on Sky Sports with a 12.30pm start as the Jambos are presented with the league trophy. With Queen of the South also in contention for the runners-up spot, the Dumfries outfit will also feel aggrieved at having to play their clash away to Livingston the day before. Depending on the results in each side’s remaining three fixtures, Stuart McCall’s men could go into the game in Gorgie knowing the exact outcome required to secure that elusive second spot. 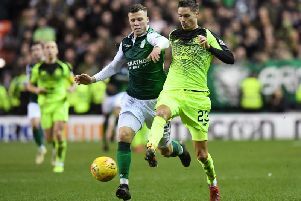 The amendment to the fixture was not welcomed by Hibs left-back Stevenson. Hibs chief executive Leeann Dempster commented on the final round of fixtures, saying: “In previous seasons, the league has ensured that all of the final round fixtures are played at the same time. A spokesperson for the SPFL responded, saying: “In response to recent criticisms of the Championship fixture scheduling for the weekend May 2-3, we’d like to clarify some specific points. On this weekend, the Hearts v Rangers match is scheduled for Sunday, May 3 to be broadcast on television and it is not clear to us why this has caused so much surprise. This is a key game in the Championship season and will inevitably attract huge interest from fans around the world. “It is unreasonable to expect all Championship fixtures that weekend to move to the Sunday when a number of them will be unaffected by the Hearts v Rangers tie. However, as a result of this fixture, all Championship clubs have been invited to submit a request should they wish to move games to the Sunday.